Most of today’s problems are yesterday’s challenges overlooked. It is always considered a wise thing to perceive problems before they arise and attend to them at the earliest. By doing so, you will be spared from the trouble you may have to undergo in the later stages. Here are few pointers to assist you in identifying the problems related to your spending and saving patterns. Potential problems related to your spending habits. Potential Problem: You decided to splurge in on your salary and went ahead purchasing everything you ever wanted on monthly installments and did rest of the shopping on your credit card. A few months later, you come to terms with reality not being able to service all your debts. Possible Solution: You must take into consideration the fact that all your loans combined should not go beyond 30-40% of your salary. It is imperative that you bore this fact in your mind before taking any new debt. Potential Problem: You spent a little too much on your vacation and are now feeling the pinch for not being able to pay up for the Insurance Premiums that you are required to pay the next month. Possible Solution: In order to deal with such a situation, you need to monitor your accounting constantly on a monthly as well as annual basis to see how the cash flow is. This will help you to manage your cash flow in an effective manner. Potential Problem: You probably got a little too excited when received your bonus amount and made up your mind to purchase a big and brand new refrigerator or an advanced split air-conditioner to tackle the summer heat or a car to swing along the countryside. But, what you failed to assess initially was whether you would be able to meet up with the increased electricity or petrol bills generated in your monthly budget. Possible Solution: You can deal with such problems by planning well-ahead and deciding firmly on entities you regard as relevant to your needs. You need to assess before you buy whether the recurring expenses of the equipment you’re going to buy in fits into your monthly budget. Potential Problem: You have decided to invest in the real estate, sector after seeing your peers make good returns, especially when the prices were rising. However, nobody explained to you the fact that your money could get bottled-up in there in the absence of a good deal. In the same way, you may have five insurance policies but not enough life insurance coverage. Possible Solution: It is important that you know the purpose of buying a financial product is it will help you solve your financial problem. Not all products in the market will solve your required needs. By setting yourself goals . you will be able to zero in on the perfect asset choice. Potential Problem: You worked hard and even managed to save up regularly cutting away all your unwarranted costs. Yet, when you come close to meet your goal (say buying a property), you realize that your portfolio doesn’t support your need. Possible Solution: Before deciding to go in for the kill, you need to choose your assets wisely keeping your goals in mind. For example, it is quite risky to keep all you money in equity in case you are aiming for a short-term goal. As a result, your capital may get exposed in the event of the market falling. Potential Problem: You made huge returns from the stock market last year. So you decide to concentrate your investments only in stock market. You have suffered in the 2008 crisis or 2000 technology bubble burst and incurred major losses and are quite suspicious if things would work out; and decide to stick just to debt investments. It must be noted that neither of the strategies will pay off. Possible Solution: You may decide to go by your insticnt, but it is not always advisable to blindly invest everything you’ve got in a single asset class. In order to reduce the risk factor and still be on the charts, you are required to broaden your time horizon of investment. Also you need to diversify across various asset classes to reduce risk. 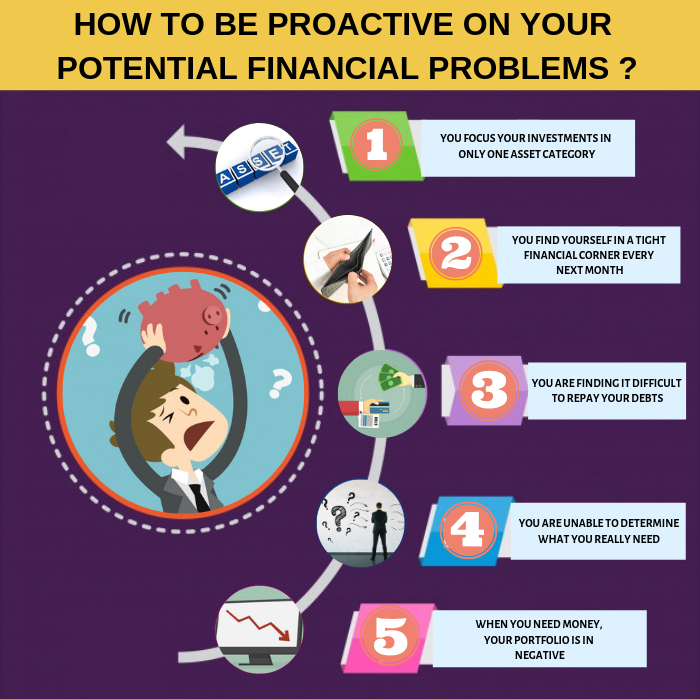 You have understood how to be proactive on your financial problems. Unimplemented knowledge is a burden. Our problem is not ignorance but inaction. You can be different from other by being alert to your financial problems well in advance.